Bimal Gurung today obliquely admitted that the Trinamul Congress would be the main rival of the Gorkha Janmukti Morcha in the coming municipal elections in the Darjeeling hills, a statement that is seen as an acknowledgment of the ruling party's growing clout in the region. Polls to Darjeeling, Kalimpong, Kurseong and Mirik civic bodies are likely to be held in May. Asked who the main rival of the Morcha would be in the civic polls, Gurung said in Sukna this afternoon: " Pahar me Trinamul se contest hoga, kya hoga - anewale din me batayga. Pahar me kitna admi hai, board ko lekar kam kar raha hai, Trinamul ka jhanda lekar kam kar raha hai. Lekin vote nehi dega. Vote toh Gorkha Janmukti Morcha ko hi milega." The statement's translation is: "There will be a contest with Trinamul or not, that will be decided in the future. There are few people in the hills who are working with the board (development boards) and with flags of Trinamul. But the Gorkha Janmukti Morcha will get all votes, nobody else will get it." Political observers noted that Gurung had indirectly acknowledged Trinamul as the main rival in the hill fray though the Jana Andolan Party and the GNLF are also set to contest the civic polls. "Trinamul leaders have been extensively campaigning across the hills by repeatedly highlighting the alleged failure of the GTA to implement development projects. Apart from that, chief minister Mamata Banerjee's frequent visits to the hills and formation of several development boards have boosted Trinamul's electoral chances. Besides, a large number of Morcha leaders and supporters have switched to Trinamul of late. 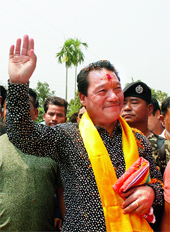 Gurung knows that Trinamul is a big political force in the hills now," said the observer.